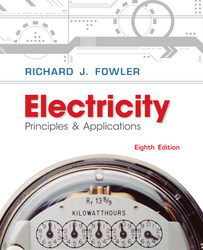 The eighth edition of Electricity: Principles and Applications is written so that a student needs no prior knowledge of electrical theory and principles and allows students with limited math and reading skills can gain a clear understanding of electricity and electrical devices. NOTE: This is a SPECIAL PACKAGE, ISBN-13 978-007-756762-0, contains the text, with included Student Data CD-ROM, and an experiments manual that corresponds to topics in the text at a money-saving price versus purchasing the components separately. MORE examples, self-test questions and Chapter review questions and problems in every Chapter! An expanded section on energy efficiency now includes information on neon light bulbs and LEDs. New! Coverage on Fuel Cells. Examples emphasizing C, V, and Q relationships and RC time constants. More examples showing how to use "powers of 10". When to italicize a symbol (abbreviation) used in formulas. Advantage of using the current divider formula. Richard Fowler (Centennial, CO) MCSD, MCT, is President of Nugget Software, Inc. Richard has served as a Technical Architect, a Senior Analyst and a Senior Systems Manager in his previous positions and now provides custom software and support for the clients of Nugget Software, with a focus on VB and SQL Middle Tier Components, and VB controls.